Get and in-depth tour of the famous Colosseum. 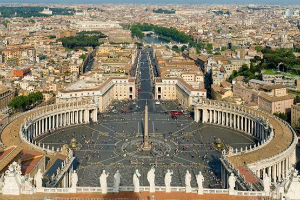 Visit the Vatican Museums. Relax on a scenic boat ride to the enchanting Isle of Capri; Enjoy a boat trip to Murano Island for a glass-blowing demonstration; Visit the Academy Museum in Florence to see Michelangelo's famous statue of David. Stroll the streets of Verona - the backdrop for Romeo and Juliet; Enjoy the magic of the Italian lakes in the captivating resort of Stresa; Visit a Tuscan winery and farm to enjoy a lunch and sample the local wine. This escorted tour includes ROUND TRIP AIRFARE FROM FARGO, visit to Rome, Pompeii - Sorrento Coast, Isle of Capri, Florence, Pisa, Venice, Murano Island, Verona, Stresa, Locarno, Switzerland baggage handling and 11 nights accommodations. • Round Trip Air Fargo - Other departure airports can be quoted.